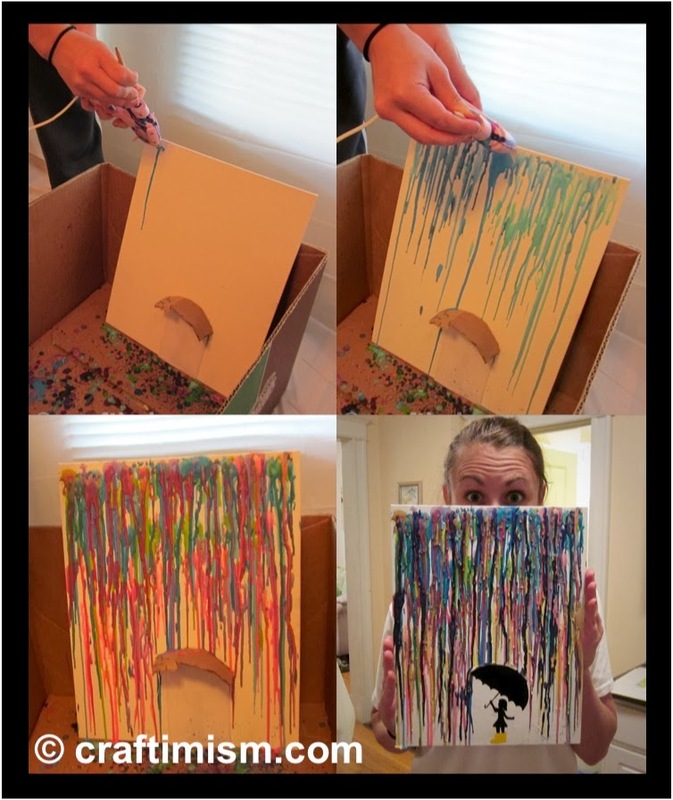 Crayon art made by dripping crayons through a hot glue gun onto canvas. If you are going to shove crayons through the glue gun, it helps a lot to remove the trigger mechanism. To do this, you can unscrew the screws holding the glue gun together (make sure the glue gun is not plugged in when you do this! ), separate the two halves, remove the trigger mechanism and then put the glue gun back together. We also used a round wooden craft stick to push the crayons through the glue gun. Be very careful, as the gun and wax get hot and unplug the glue gun when not in use! My first attempt at a similar project where I glued crayon bits to cardboard and then used a blowdrier to melt the crayons can be seen here. Again, I painted the canvases, this time in yellows and purples. To change it up a bit, I decided to insert crayons into the glue gun to melt them onto the canvas. I removed the paper from the crayons first and then shoved them through the gun. There was a learning curve with the glue gun and most of the splatters seen with the purple crayons disappeared once I removed the trigger mechanism from the glue gun (see note above). Cara had a great idea for her project. She wanted to do something abstract with some geometric shapes and such. 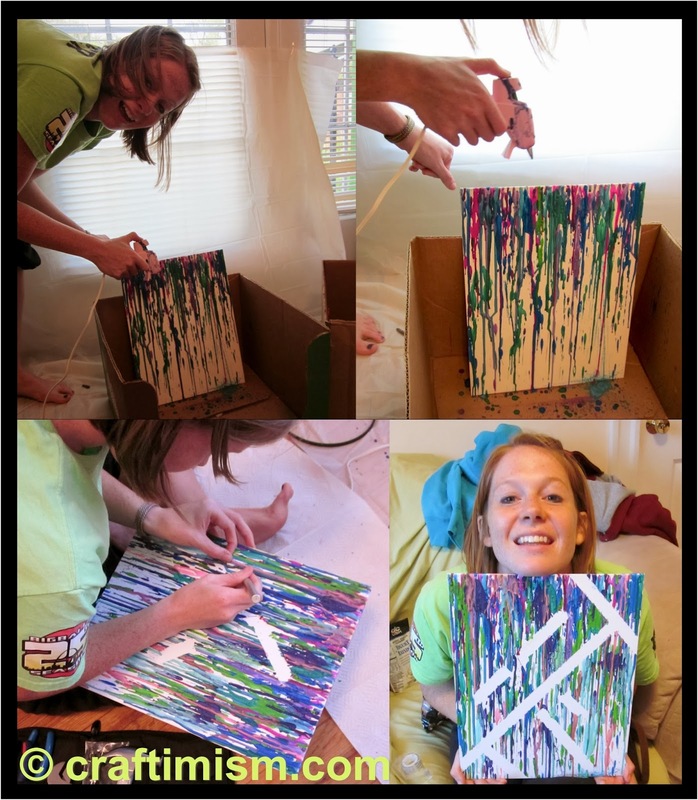 She used scotch tape (I think painters or masking tape would have worked better but I did not have either) to make the design on her canvas, and then melted crayons on top of the canvas using the hot glue gun. After that, she removed the tape (using an exacto knife to score the sides of the tape). I think it turned out very cool! Laura wanted to try something different with her crayons art, so she melted the tips of the crayons and then used them like a brush to paint the wax onto her canvas. This provided her more control and made some very interesting blending effects. Way to be crafty! 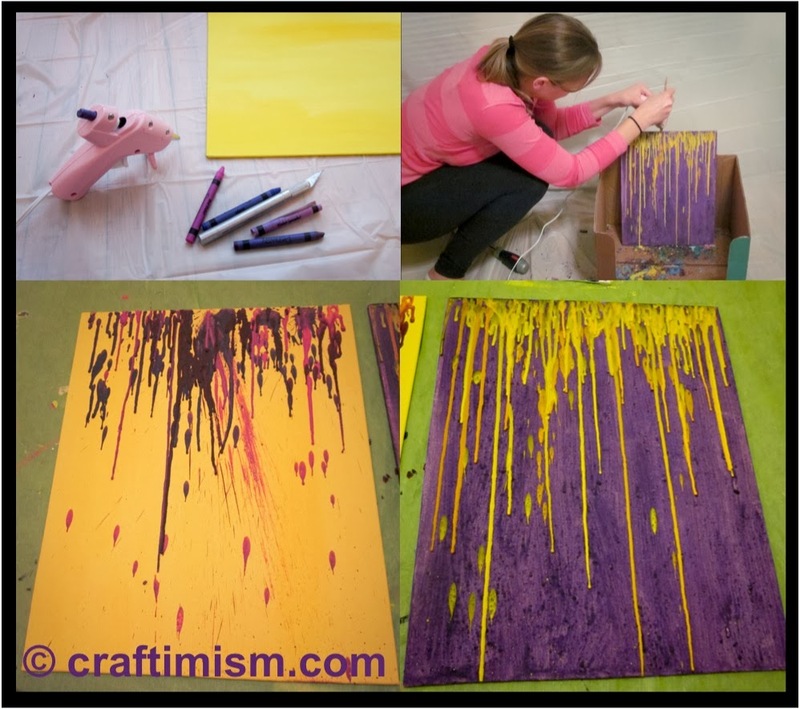 For more melted crayon ideas and inspiration, click here. To finish the artwork, I used super glue to attach a sawtooth hanger to the back of the canvases, ~3" from the top.